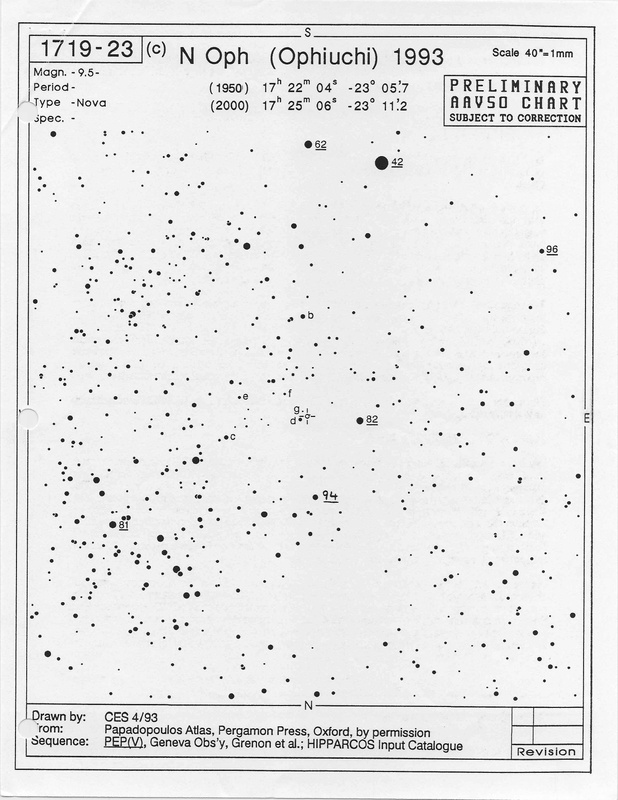 Please use the accompanying AAVSO chart to observe N Oph 93 and report your observations to AAVSO Headquarters. Indicate the comparison stars used when reporting observations, and as the nova fades use the letter sequence of fainter comparison stars (fainter than 9.6) until we issue a "d" scale chart (in preparation) with faint magnitudes. Congratulations to Paul on his latest (ninth) nova discovery! 1. 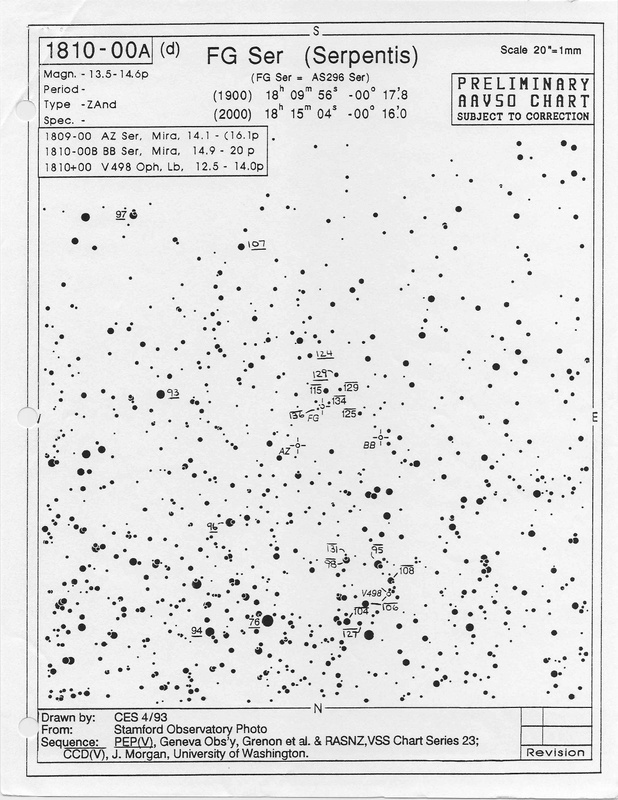 AAVSO preliminary chart 0947+69 issued in 1979. The sequence on this chart came from the SAO Catalog and visual estimates by active AAVSO supernova searcher T. Fetterman. There may be zero point problems and inconsistencies in this sequence. 2. Thompson-Bryan chart. Some magnitudes are photoelectric and some have been transferred from the 1979 AAVSO preliminary chart 0947+69. There are two versions of the Thompson-Bryan chart. Regrettably, some comparison star magnitudes on the earlier version, which we distributed with AAVSO Alert Notice 169, are slightly different from the later version published by Cambridge University Press. 3. Guide Star Catalog chart. Magnitudes independently obtained by the Space Telescope Science Institute. For some stars these magnitudes are quite different from the photoelectric (V) magnitudes. 4. "The Astronomer" chart. 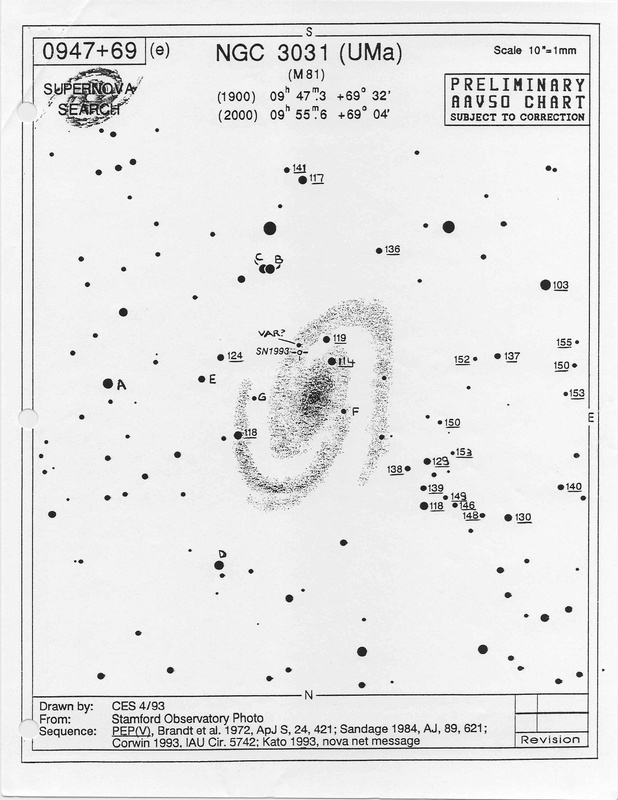 Prepared and distributed by Guy Hurst, with selected photoelectric (V) magnitudes and AAVSO visual magnitudes from the Thompson-Bryan chart. In the accompanying AAVSO chart of NGC 3031, we have revised the magnitude sequence that was distributed with AAVSO Alert Notice 169. We have adopted photoelectric magnitudes reported in the astronomical literature and on the Thompson-Bryan chart. We have replaced with a letter sequence the AAVSO visual estimates from the chart distributed with AAVSO Alert Notice 169. We have requested that the astronomical community obtain homogeneous photoelectric photometry of this field; to date no new photoelectric measurements of comparison stars have been reported. We request all observers monitoring this bright supernova to specify what comparison stars they are using for each estimate when they report their observations to the AAVSO. Please indicate from where the sequence came, i.e., AAVSO Alert Notice 169 or AAVSO Alert Notice 170, or any other source. Specifying the comparison stars and indicating the sequence source are extremely important, because as soon as we have a homogeneous comparison star sequence for all the stars observers have been using, we will revise the reported magnitudes. The cooperation of all observers will be greatly appreciated. Please continue to observe SN 3031 and report your observations to AAVSO Headquarters as it slowly fades. We have been requested to monitor the interesting symbiotic star FG Ser in order to have good coverage of its forthcoming predicted eclipse. With AAVSO Alert Notice 167 we distributed to our observers a Royal Astronomical Society of New Zealand chart for FG Ser with a letter comparison star sequence. Accompanying is a chart recently prepared by Charles Scovil. It contains photoelectric comparison star magnitudes (underlined) from Geneva Observatory, Grenon et al., and RASNZ Variable Star Section Chart Series 23, and CCD comparison star magnitudes (overlined) made by J. Morgan (University of Washington) and provided by G. Wallerstein (University of Washington). The two comparison star sequences complement each other. Please report your observations using these sequences. If you have already reported observations using the letter sequence distributed with AAVSO Alert Notice 167, please convert your letter estimates to magnitudes and re-submit them to AAVSO Headquarters. Be sure to indicate that they are re-submissions. Your converting your letter estimates and re-submitting them will help us greatly in processing your observations. Please monitor this interesting star as closely as you can in the coming months and report your observations with your monthly reports. Thank you very much for your observing efforts and contributions, and for your enthusiastic response to special requests from astronomers and to discoveries of novae and supernovae.